(The Frisky) -- After my engagement ended, my tolerance for weddings was low. Very low. That first week spent on my couch in pure misery saw me turning my eyes away from any and all wedding references. The wedding book I was given by my almost-mother-in-law got hidden in the back of my closet, along with our engagement party invitations and, of course, my engagement ring (now out of sight in a locked safety deposit box!). Her broken engagement has left writer with mixed emotions about engagements. Anything of a romantic nature in pop culture repulsed me, and for awhile all I watched was the news. It was depressing, just like me! Eventually, the sadness began lift and I was able to enjoy crappy television, movies, and chick lit as much as I had before my breakup. Sometimes, I find myself tearing up over romantic nonsense. I sobbed during "He's Just Not That Into You," when Ben Affleck proposed to Jennifer Aniston. The look on his face -- yeah, I know Affleck isn't the world's greatest actor, but I was moved -- reminded me of the look my ex had on his face when he proposed to me. While he eventually claimed that he had cold feet about our relationship before he proposed, that look always reminds me that his intentions were true in the moment he asked. Unfortunately, that look also made it hard to move on and accept things were over; and when I finally did accept it, I wondered if I would ever trust that look from someone else. The Frisky: Is it bad to live together before marriage? Though I'm not sure if I will end up getting married, I don't think "marriage is a crock," nor do I mock excited brides or act as though those who are married should be pitied. Two of my closest friends have really lovely marriages. I envied their happiness before they tied the knot, I envy it now, and I'm supremely happy for both of them. I didn't think I could feel more secure in my relationship. And then we got engaged, and, lo and behold, I did. I was now 1000 percent sure what we had couldn't be broken. And then suddenly it was over. If anything, our engagement made our relationship less secure, because it brought out his fears and insecurities about what such a "permanent" commitment would mean. But even without an engagement, the longer our relationship had lasted, the greater the likelihood those fears and insecurities would have rise to the surface. 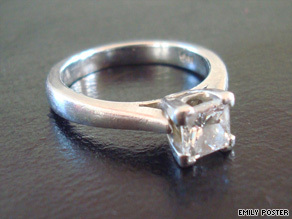 The Frisky: Is my busted engagement a problem for you? I have refrained from snapping at her to remember her audience. The last person to talk to about the "security of having a ring" is the girl who had a ring and then got dumped. The Frisky: How long should you wait before getting engaged? What I do tell her is that your relationship is secure or it's not. A ring makes it no more or no less secure. Being engaged can be romantic, wonderful, and exciting. Scary and anxiety-causing? Sure. But secure? No. A ring is just window dressing. What's behind it is either quality, or it's not, or it's somewhere in between and it's up to the two of you -- not a piece of jewelry -- to make the most of it.